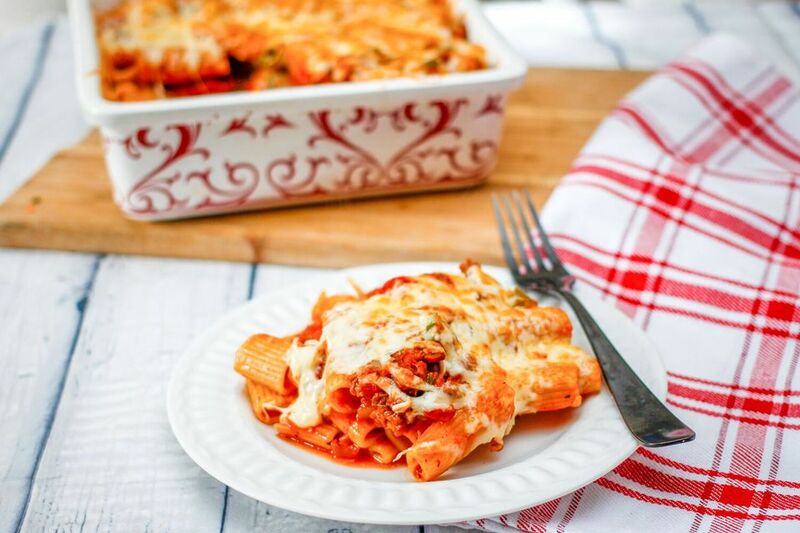 This ziti casserole is a simple combination of a seasoned tomato sauce and ground beef, baked to perfection with a melty mozzarella cheese topping. You might want to use macaroni in the recipe, or use a mini penne or a similar tubular pasta. All you need to make this baked ziti dish a spectacular meal is some garlic bread and a simple tossed salad. A Caesar salad would be fabulous as well. This is an excellent dish to take along to a potluck dinner. Or make two casseroles and freeze one for another day. You can vary the cheese in this. Feel free to add some Parmesan cheese to the casserole mixture and the topping. Cook the ziti in boiling salted water following the package directions. Drain well and set aside. Lightly butter a 2 1/2-quart baking dish. While the ziti is cooking, drizzle the olive oil in large skillet or sauté pan and place it over medium heat. When the oil is hot, add the ground beef, onion, and green bell pepper. Cook, stirring until the onion is tender and the beef is no longer pink. Drain off the excess fat and then add the tomatoes, tomato sauce, basil, oregano, garlic powder, salt, and pepper. Bring to a simmer. Add the cooked pasta and half of the mozzarella cheese. Transfer the mixture to the prepared baking dish. Top the casserole with the remaining mozzarella cheese. Bake the ziti casserole for 25 to 30 minutes, or until hot and bubbly. To make it ahead, prepare the casserole, cover it tightly with foil, and refrigerate. Take it out of the refrigerator about 30 minutes before baking. Bake as directed, until hot and bubbly. Replace the ziti with elbow macaroni, penne pasta, or mini penne, or use a similar pasta shape. Add an extra 8-ounce can of tomato sauce for a saucier casserole. Replace the ground beef with 1 pound of bulk Italian sausage, ground turkey, or ground venison. Brown with the onion and bell pepper. Add an extra 1/2 pound of ground beef or Italian sausage for a meatier casserole. Replace the mozzarella cheese with a pizza cheese blend, an Italian cheese blend, or cheddar and mozzarella. Add extra mozzarella cheese to the topping if you like.